← How to delete unwanted pages by PDF Editor? VeryPDF PDF Editor is a helpful application for viewing, editing and annotating PDF. But now we have updated it to version 4.1 with more powerful functions. Splitting PDF files into pages or just extracting one page from PDF are available now. In the following part, I will show you how to split PDF into pages by PDF Editor. PDF Editor has user friendly software interface, so you need to install it. Once the downloading finishes, there will be an exe file. Please double click the exe file and follow the installation message to install it. The installation takes a few seconds. Once the installation finishes, there will be an icon on the desktop. Simply click the icon then you can launch this software. The following snapshot is from the software interface, now let us check how use it together. Please click Open to add files to software interface or you can open the containing folder then drag it from its containing folder to software interface directly. Then click option Document, there will be dropdown list. Please choose Split Document option then you will see the following snapshot. Also if you need to delete pages or merge PDF file meanwhile, please click corresponding options. First, please click button Browser to choose the file needed splitting. Please note now this software can not be use to split PDF in bath. When you need to split PDF in batch, please use software PDF Split and Merge. And then choose splitting method,PDF Editor provides three methods of splitting PDF files:split PDF by bookmarks, split PDF file by specifying every n pages or you can specify pages by inputting page number or page range directly. Please input the output file path by clicking button Browser. Or you can overwrite the source PDF file. There is an button named Option, which looks like the following snapshot. Here you can choose whether to keep the bookmarks or AcroForms or not. When you finish setting, please click OK to back to main interface. Now click button Run to launch this splitting process. And the splitting process information will be shown in the log part. 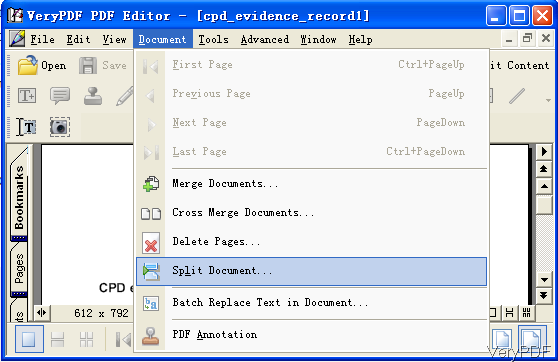 When the splitting finishes, the output file will be not shown in the PDF Editor View windows. Please find the split PDF file in the specified folder. If you need to edit the split PDF file, please add them them software interface one by one. Then edit them and save them again. Note:this is Windows version software and it supports all version PDF files. If you need to get one, please pay for PDF Editor then you can use it forever. During the using, if you have any question,please contact us as soon as possible. This entry was posted in PDF Editor and tagged split PDF. Bookmark the permalink.